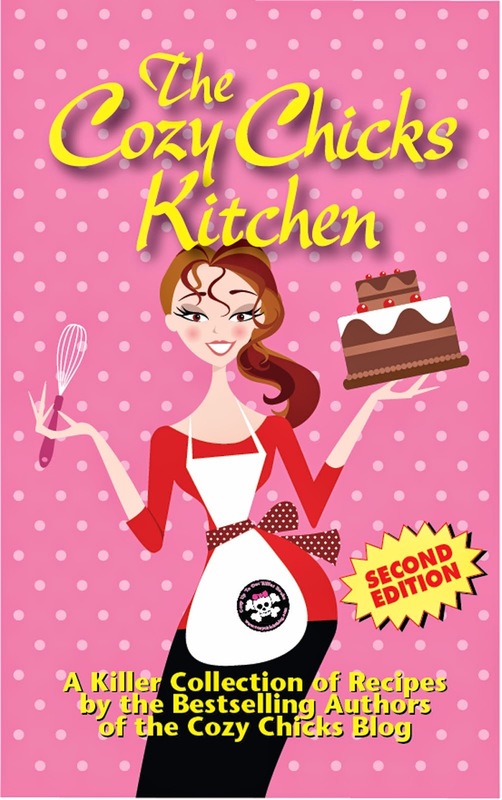 Cozy Chicks: Pets Party On with a contest for you! Pets Party On with a contest for you! Victoria Abbott and Mary Jane Maffini and various furry critters! I write three mystery series as Mary Jane Maffini and collaborate on the book collector mysteries with my daughter as Victoria Abbott. All of them have dogs and/or cats. A book without a dog or cat just seems incomplete to me somehow. A story should appeal to our senses. What can appeal to our senses more than the soft warmth of fur, the soothing sound of a satisfied purr or the warning of a convenient bark? I can't imagine writing without a pair of cuddly pooches curled up under my desk. Animals add heart to our tales of mystery and mayhem. They can show the soft side of a tough sleuth and give a touch of domestic bliss to the most footloose of protagonists. A pet ensures that a character will think about someone besides herself or himself. They need to be fed, walked and cared for. They can’t be left behind. There’s more to it, of course, there’s the immense pleasure we get from our pets, the unreserved affection and acceptance. You can’t buy that kind of love, my friends. Here at the Maffini house we share our lives with dogs, because one of my daughters and a grandson are violently allergic to cats. I’ve always enjoyed cats and I miss their frisky presence, so I am glad of the fictional kitties too. My favorite is the little calico cat in my Camilla MacPhee books. Calico cats are my favorite. The cat is called Mrs. Parnell’s cat because Camilla doesn’t quite see herself as a pet person. So while she takes good care of “Mrs. Parnell’s cat” over the years, it never gets a name. My Canadian publisher called me when she had the manuscript for the sixth Camilla book in hand. My editor—a wonderful young man named Allistair and a committed cat person—was distressed that (and I quote) ‘the little cat still doesn’t have a name after all these books’. I love that story. I did explain that the cat’s name was Mrs. Parnell’s Cat and the fictional calico was fine with that. I may have promised to have Camilla reform. I’m working on book seven now. We’ll just have to see how that plays out. She never made the cover and we're not sure who the black cat is! Mysteries have been great places for me to let my dogs ‘live on’ and perhaps have more fun than they normally do. We feed our dogs food from the vet and never take-out, but the hapless Fiona Silk in the mysteries of the same name often lets her Samoyed, Tolstoy, have take-out fries. 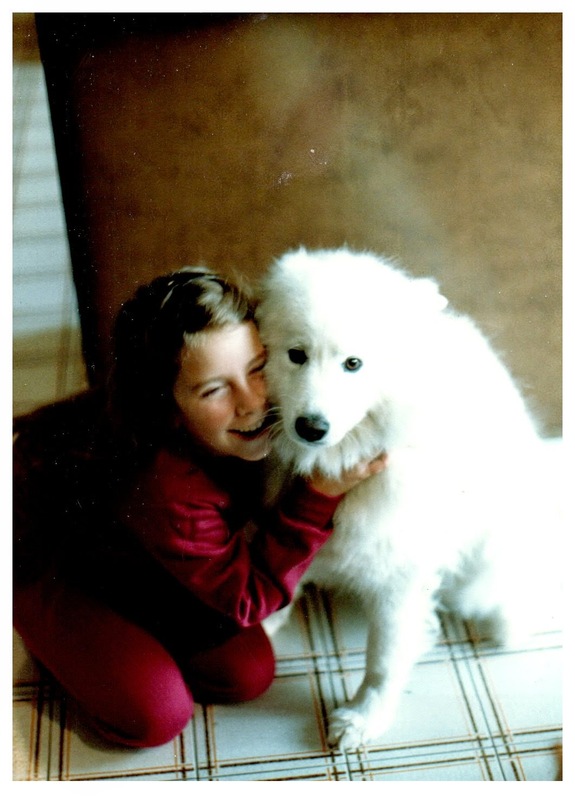 It’s fiction and Tolstoy reminds me of my own Samoyed, Bella, now long gone. Should I have a warning note: Kids, do not attempt this at home? Here's Bella with Victoria, a while back. 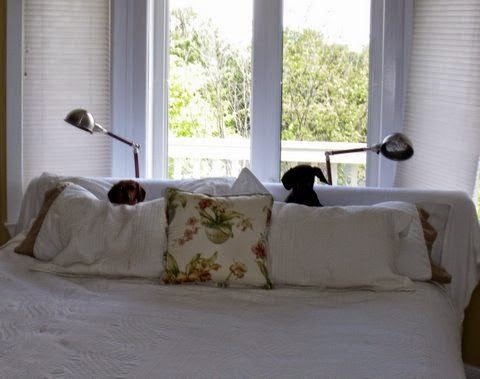 A pair of rescued miniature dachshunds bring some extra life to my Charlotte Adams organizing mysteries. My own Daisy and Lily are nice little girls, therapy dogs and very cuddly are the models. Somehow Truffle and Sweet Marie are on the wicked side, shredding toilet paper to show their displeasure and generally being spoiled. Charlotte’s dogs can’t help it. They were found abandoned on the medium of the Interstate. That’s my story and I’m sticking to it. 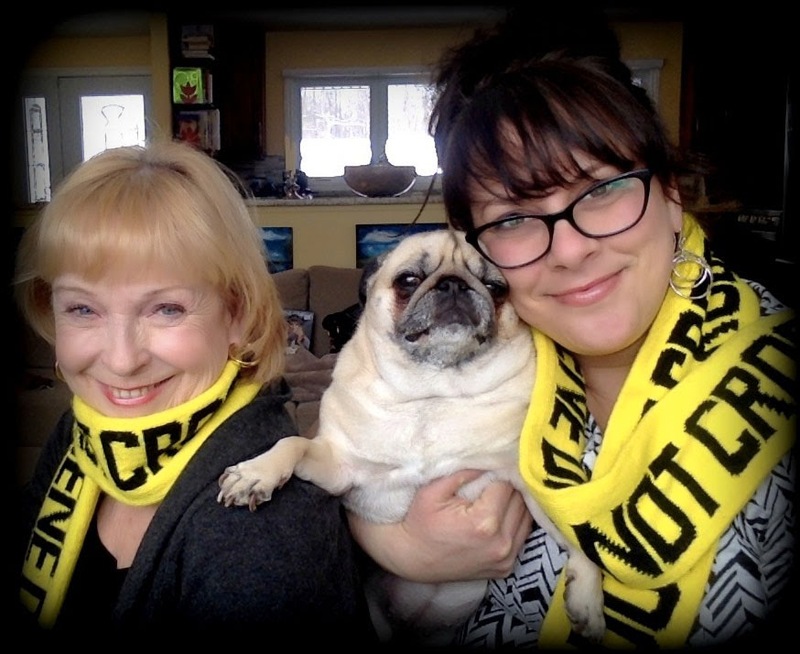 The book collector mysteries (written with Victoria) have a pug who is the icon for the series. Walter appears on every cover. And because life can mimic fiction, Victoria is now ‘mum’ to Peachy the Pug, who is the spitting image of Walter. Peachy never misses a book launch either. She is a bit more princessy than Walter, but don’t tell Victoria or Peachy I said that. We’re not sure where Good Cat and Bad Cat come from, but we’ve become quite fond of them. 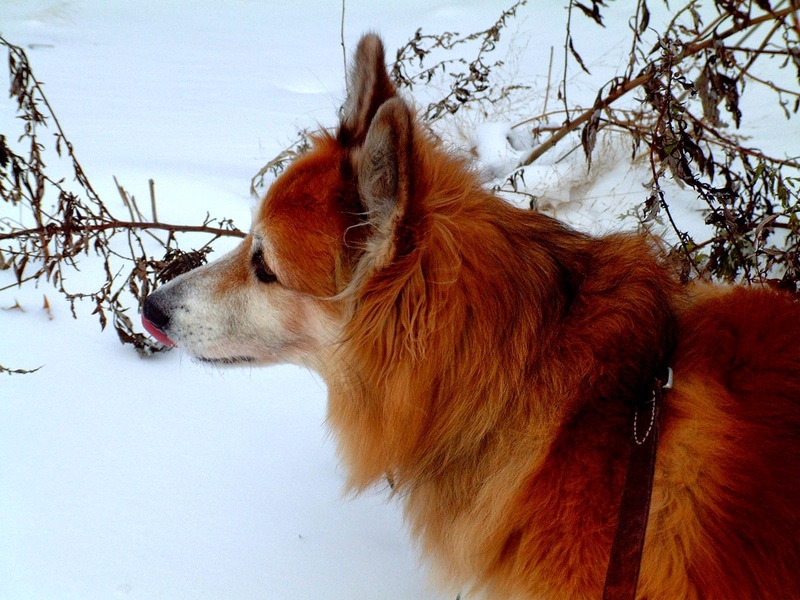 Finally, there’s Smudge, the dog I still miss every day since he crossed the Rainbow Bridge at thirteen. He was not easy – a pup who was on his way to the pound when Victoria rescued him and gave him to us for an anniversary gift. The gift turned out to high-strung mix of Corgi and Border Collie. handsome with no legs and a spectacular tail. He was loyal and loving and his spirit still guards my front hall after many years. I have an idea for a series in which he could play a role. We’d both like that! And you my friends will be the first to know. 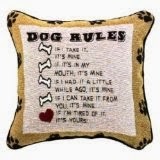 Answer ANY ONE of these questions in a comment and you’ll be in a draw for our dog or cat-themed prize! 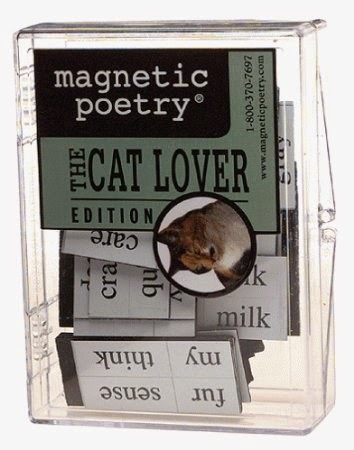 Win a Dog Rules Cushion or The Cat Lover's Magnetic Poetry kit. Consider this like an open book test, because the answers aren’t (ahem) far from here! Who are the dachshunds in the Charlotte Adams books? What is Fiona Silk’s Samoyed Tolstoy favorite food? Aside from Walter the Pug, there are also two Siamese in the Victoria Abbott book collector mysteries. What are they called? Does Camilla MacPhee have a calico cat? Bonus: what is that cat's name? Have fun and don't forget to pat your pets! Fiona Silk’s Samoyed Tolstoy favorite food is take-out fries. I have to admit that I prefer books with pets in them. It humanizes the characters and gives most readers a common ground with them. I love the book collector series, where Good Cat and Bad Cat share the pages with Walter. And he's probably lucky he only shares the pages and doesn't actually live with them. I think Bad Cat could easily taken him down. Can't wait for Marsh Madness. 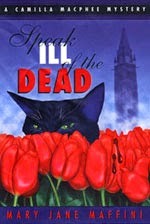 I love mysteries with pets.Though I prefer dogs (we have 4), I've enjoyed many books with cats. But I have to ask why there are no cozies with hedgehogs? :) Camilla McPhee does have a cat, Mrs. Parnell's cat - even if she's not quite ready to admit it. Yes, Carmilla has a cat and it is called Mrs. Parnell’s cat.I love reading cozies with pets in them. It just makes them homier. Oh, MJ, I loved reading this!!!!!!! I have read, own, and love every book you've written including, of course, this latest series you're writing with your totes adorbs daughter. Camilla MacPhee is the woman I miss. Her and her band of friends, especially Alvin. I cannot WAIT for a new Camilla novel. I really enjoyed meeting Walter and I just love Good Cat and Bad Cat. I look forward to reading more about them. Truffle and Sweet Marie, who are into shredding, are part of the Charlotte Adams books! I love Smudge's picture! Phoebe and Smudge would have lots of fun I'm sure. Give Daisy and Lily a belly rub for me. I LOVE mysteries (and other books) with pets in them, especially dogs, but cats are fine, too. I laughed at Truffle and Sweet Marie, the miniature dachsunds, when I read the Charlotte Adams mysteries. I have the Camilla McPhee books (except one, which I haven't been able to find anywhere!) and look forward to actually starting to read them some day! I'll be sure to watch for the calico cat named (or not) Mrs. Parnell's Cat! And I'm about five pages into The Sayers Swindle right now, and looking forward to spending more time with Walter the Pug! The Siamese in the Book Collector Mysteries are called simply 'Good Cat' and 'Bad Cat'. Love this series! Camilla MacPhee has a cat called Mrs. Parnell's cat. I oftentimes buy a cozy mystery just because it has a dog or cat on the cover. I am a dog person and have 9 Schipperkes that I adore. Bad Cat and Good Cat are in the book with Pug. I enjoy stories with animals in them. I have a dog with me at all times so the hero/heroine should have one too. And if they can help solve a case - so much better. A fun column today - thanks MJ. Of all your series' pets, I like the independent spirit of Truffle and Sweet Marie, and love it when they "disorganize" Charlotte (eg. hiding her keys). Pets have always been very important in our family, from Smokey, a Heinz 57 rescue dog on my 12th birthday, to Bosun, a retriever who sailed with us, to the immortal Psycho, who lived a record 23 years! Hey - he could have been the model for the black cat on Speak Ill of the Dead. Fiona Silk's Samoyed Tolstoy's fave food is take-out fries! Camilla MacPhee has a calico cat called Mrs. Parnell's Cat - I'm taking your word for it. I haven't read your mysteries for some time though I enjoyed them and generally enjoy fiction/movies which includes interesting or comical pets as characters. I have two charming cats at present, Cid & Ambrose, and have also had great dogs as pets in the past. Cordella - Prayers for you and your Spats. It is so hard when we have to say goodbye to our loved ones. But when he finally decides that it's time to cross the bridge, he will be reunited with Bandit, and they will both be with you in spirit. You gave them a long, happy life and that is the greatest gift. My cats have candy names: Snickers, Skittles and Reese (Reese's Peanut Butter Cup). Yes, she has a Calico named Mrs. Parnell's Cat. Maybe your Smudge has met my dogs that also crossed the Rainbow Bridge-they range from a toy poodle to German Shepards. 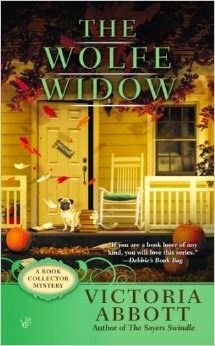 I think everything is better with pets-mystery novels included! Sadly, one of my elderly furkids crossed the Rainbow Bridge Tuesday; Blizzard was 3 years and 2 months old to the day-a grand old age for a rat (their lifespan is only 2-3 years!). I now have 3 other rats (Eccleston, Eros, and Nougat) 4 cats (Aleister, Calumet, Licorice, and Mariusz) and an off track thoroughbred named Harley! Truffle and Sweet Marie are the dachshunds in Charlotte Adams books. 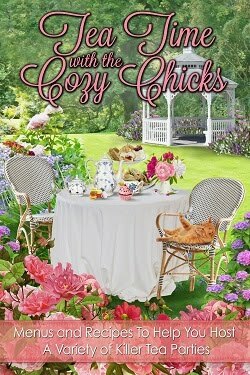 I admit I tend to look closer at Cozy Mysteries if there is an animal on the cover or a pet involved. I have a dog, Louie and a cat. George (female) Louie finds it great fun to run straight to my bed when he has been in the rain and mud (even though he knows sit and stay. George is a fiend for toilet paper, she will even tear open a wrapped package to get to it. Fiona Silk's Samoyed is named Tolstoy. We've always had dogs and cats growing up but right now we just have cats. Our cats rule the house and I wouldn't have it any other way! Thank you for this wonderful giveaway! Truffle and Sweet Marie are the dachshunds in Adams books. Congrats to Linda Kish and Barbara T who are the winners of this contest. Thanks everyone for coming by! 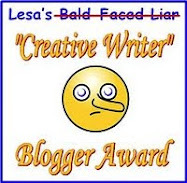 Of course, there will be more contests in the not too distant.